Fresh Salmon file with sautéed shallots fresh dill in Cognac-cream sauce, served with potato and vegetables or penne tomato sauce. 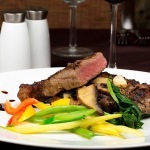 Grilled New York Steak (8oz.) 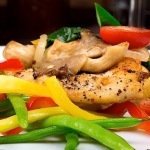 with sautéed mushrooms served potatoes and vegetables or penne tomato sauce. Veal breaded and baked with tomato sauce and mozzarella served with potato and vegetables or penne with tomato sauce. Arborio rice with mussels, squid and shrimps with fresh tomato and basil sauce.